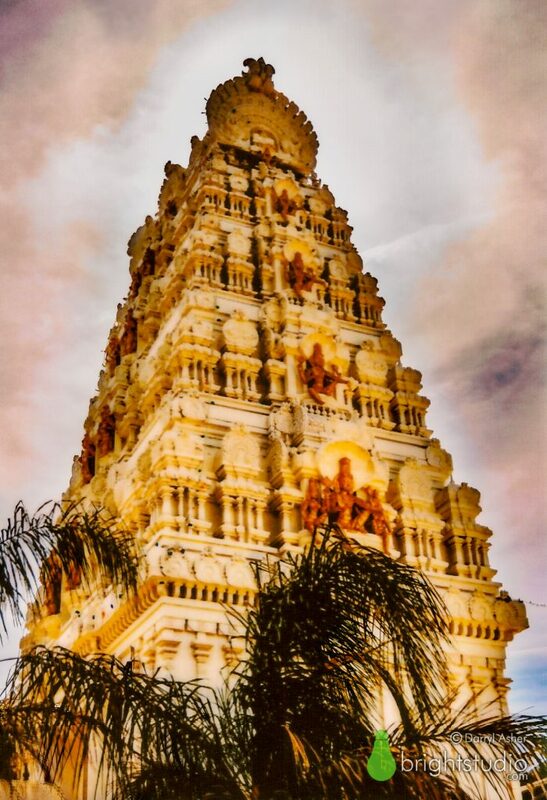 Hindu Temple, Los Angeles. Analog/digital hybrid Fuji Instax print. I love Los Angeles and visit pretty often. I usually allow myself a lot of free time to just drive around and site-see. No surprise, there’s a lot to see! If you drive north from Malibu Beach on Malibu Canyon Road, you’ll catch a quick glimpse of the upper part of the Malibu Hindu Temple. I’ve driven that road many times and never noticed it until my most recent visit. A narrow road leads to the entrance to the parking lot, which is guarded by a large double-gate. Fortunately when I stopped, the gate was open, but there were no cars in the parking lot. I don’t know the etiquette of a Hindu Temple, but I always try to be respectful and unobtrusive when photographing anything. I parked just inside the gate and began shooting. At one point, someone stepped out of the main door briefly. Before I could wave or say hi they must have taken note of what I was doing, didn’t care, and stepped back inside. I’m sure photography is a common occurrence at such a spectacular place. I first shot with my Fuji Instax camera, which is essentially a toy camera that creates small instant prints, then I shot with my Nikon DSLR. I liked the prints from the Instax camera, but it lost quite a bit of the details. This is something I usually like about shooting with the Instax. There’s something appealing about making a subject a bit abstract. I like how it reduces things to their essence. I also like instant film because its analog nature seems more tactile. The grain, emulsion, and imperfections become part of the charm. In this case, the print from the Instax camera was a bit more abstract than I liked. The ornate facade of the temple needed more detail than the Instax camera could be provide. The final image is something I call an analog/digital hybrid. The original image was shot on my Nikon DSLR, but was output to Instax instant film, which gives it a nice analog feel, with visible film grain and some abstracting of details. I then scanned the Instax photo and selectively merged it with the digital original to make the final 13×19 inch print. So, about 99% of the final image is on instant film, but a few select areas are from the original digital image to preserve sharpness in critical areas. This method preserves enough of the details to honor the architecture, but also shows the grain, imperfection, and warmth inherent in analog photography. Analog/Digital Hybrid image from Fuji Instax instant film and Nikon DSLR. Enlarged to 13×19 and printed on museum quality matte finished paper with archival inks. Available as a 13 x 19 inch print produced with archival, museum quality materials. Don’t forget to sign up for the newsletter, and you’ll be entered in my quarterly drawing to win a free print of your choice.